The server is the POP server given to you by your mail service provider. 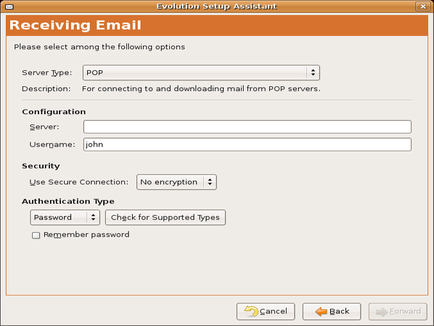 Often, system and network administrators will give the mail server a clear name such as "pop.server.host.com" or "imap.server.host.com". If this is true for your mail provider, you can tell the type of server from the first part of the server's address. If you do not have a POP server, you must choose a different server type. Click on "Back" and do so. If you do not know the type of mail server your network is using and cannot tell the type of server from the address, you need to contact your system administrator to find out. The username is imported from the name you gave Evolution on the preceding page. Here it is lowercase because all mail account logins are lowercase by default. If you use a different login to retrieve your email, edit this field to suit your needs. 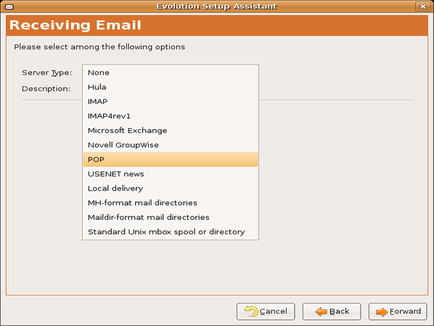 Like most email programs, Evolution retrieves mail without encryption by default. You must tell it that require either TLS or SSL encryption. If your email service provider has not told you to use encryption, do not try either form of encryption -- it will only cause a fault in mail retrieval. Finally, you can tell Evolution to use a particular type of authentication. The vast majority of the time, you will need to use only a password with your username. Other authentication types are available, however. If you do not know which one to use, simply use the default: "Password". If you are confident that the default "Password" will not work and are unsure of what kind of authentication is supported by the server, Evolution can check for you. Simply click on "Check for Supported Types". It will then poll the server to find out what forms of authentication are available. If you want Evolution to remember the password for your email account and not to ask you for it everytime it check for new messages, tick the box next to "Remember password". Evolution will ask you for the password the first time you check for messages and will then remember it. Click "Forward" to enter the options for receiving email. The first option on this window pertains to how long Evolution should wait between mail checks. If this box is not ticked, Evolution will not automatically check for new mail. Under "Message storage", you have the option to leave the messages on the server. If you tick this box, every email client that accesses your account will download all new messages received since that mail client accessed the mailbox, not since the mailbox was last accessed. This is great for keeping your mail on more than one computer. If you go a long time between sessions on one of the email programs, however, the mail retrieval process could be quite long the next time you download your messages. Finally, "Disable support for all POP3 extensions" is helpful when accessing older or misconfigured servers. POP3 extensions are add-ons to the Post Office Protocol which enable various levels of greater functionality. Some servers support them; some do not. If you have trouble downloading your email, toggle between selecting and deselecting this box. When you are done with the email retrieval options, click "Forward" to tell Evolution how to send your email.